I know a couple other people are doing this right now, but in case you've missed out or haven't heard about it, you can get 20% off of Konad products at OCNailArt.com! Just use the code 'scrangie' at checkout and you'll receive 20% off your order. Another perk is free shipping over $20, and that includes INTERNATIONAL SHIPPING!! I'll add this info in my sidebar so it's visible in case this post gets buried. Use code scrangie at ocnailart.com for 20% off and free shipping over $20. Here's a little inspiration, and I am making an effort to do more Konad posts. I have been working on doing a tutorial, but I just haven't gotten a chance to finish it! OMG! I just bought konad and love it! I have to check this out! 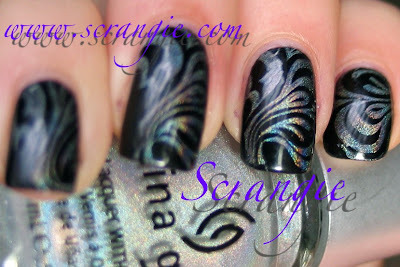 That first pic of the black swirls on holo is easily one of the most awesome Konadicures I have ever seen. Wow your konadicures look amazing! I especially like the first 2. Ooooh please do tutorials! I would love actually a tutorial of you just showing how you polish your nails because you do it so perfectly! I've never tried any Konad, but after seeing so many good things about it and seeing your amazing nail designs, I'll just have to try it now! I finally got on the Konad train. Thanks for the deal! Wow Scrangie! Love your designs. Especially the skull one. You do a fantastic job. by the way, do u think that opi's mini set's brush is too small to work with? or is it juz me? free shipping doesn't include international shipping :( it's only for ground (domestic) shipping. I noticed you're using "regular" polish with your Konad. Does that work as well as buying the Konad polish? Also, have you ever purchased anything from the OCnailArt site? Or know anyone that has? Nina, I don't have a video camera so I can't do a really good tutorial, but I can try! Anu, LOL I know, strange combination! Atomica, you'll love it! You can make every manicure have your personal touch, that's what I love about it! Lucy, thank you so much! Jojoba, thank you so much! That Etude House stuff looks so amazing! Peggy, haha thank you! I agree, the OPI mini brushes are tricky to use. They're so short! Anyonymous, it sure does, it says right on the front page of the website that free shipping includes international! MrsKiwiYeti, yep, most regular polish will work just fine with Konad. 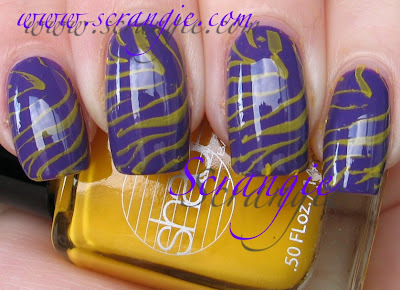 Polishes that are thick or opaque work best, as do holos and chromes. You really don't need the Special Polish at all! How'd you get that discoball like silver? it's not a konad shade right? did you just use normal nail polish? I've tried my normal polish and it doesn't seem to work... the scraper scraped it all off... =Z maybe because my design was small and have skinny indentations. i'll try it again when i get new plates like yours. btw. what's the name of the glittery silver china glaze shade you used to stamp? you should start to encorporate the nail colour in all your pictures.. If you can get to Costa Mesa for the Marketplace, I highly recommend visiting Kathleen's Nail Art booth! She and her daughter, Emma, have a great set-up. The image plates are all hung up in perfect order on one side. I found exactly what I was looking for and then some! Kathleen and the very helpful Emma are both willing and able to apply the designs to your nails while you are there, as well as give instruction for your own perfect application when you get home. She has both Coraline sets, many of the popular sets, for both beginner and professional and she has all the accompaniments, like stampers, plate-holders, etc. Kathleen also has rhinestones and every color Konad polish you could imagine, the princess bottles, and even the glitter topcoats! As a bonus, Kathleen also sells some familiar brands of polish (China Glaze, for one example)in the most popular colors. It looks like she will be there again this Saturday, but I recommend sending her a text or giving her a call to find out her exact location in the very large swap meet. I had a blast and will be returning next month, when I have birthday money! Janice, since I've already posted about them before I didn't think I needed to add the color names- but it's China Glaze OMG. Regular polish has to be opaque or thick to work, metallics work the best! Wixbetty, that is SO AWESOME!!!! Thank you for posting this!!! 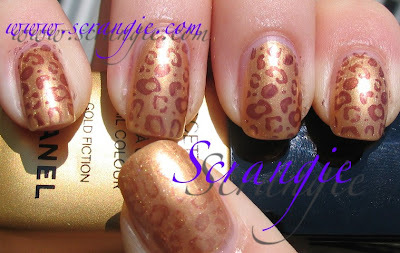 I was so excited for my Konad to come in the mail & it did BUT when i put the polish over the plate & scrape, the polish dont seep into the whole image & whne i stamp theres only dots on the stamper. The image plates are old and from another stamping kit, is this the problem? Please help!! Maminwife0608, Have your old plates worked before? Some of them have a plastic film on the top, make sure your plates have the plastic film removed. Also, make sure you don't scrape too firmly or it will remove too much polish. What plate is that skull from? I Love it!